The Barrington Coast's highest point. 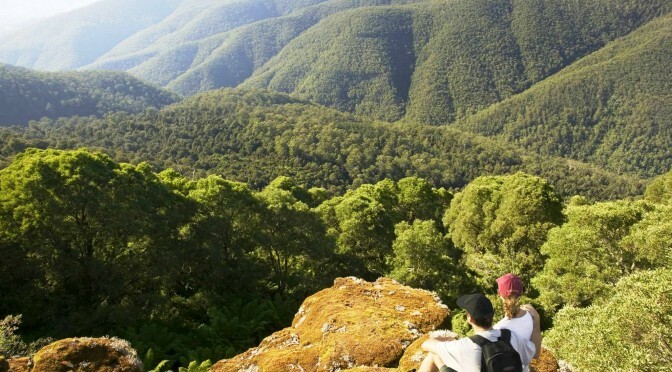 Barrington Tops is a World Heritage-listed wilderness region with a rich history and breathtaking scenery and wildlife. It’s located at the highest point of the Barrington Coast region of New South Wales, between Taree & Port Stephens. There’s lots of outdoor adventure to enjoy and it’s easy to get here: from the Pacific Highway via the Bucketts Way or from New England via Thunderbolts Way. Carved out of an ancient volcano in the Mount Royal Ranges, Barrington Tops rises from near sea level to 1586 metres and is part of the Gondwana Rainforests of Australia. It became a World Heritage site in 1986 and was added to the Australian National Heritage List in 2007. Barrington Tops is the highest subalpine area in the country outside the Australian Alps and regularly gets a dusting of winter snow. Check out the seasonal photos posted on the Barrington Tops Tourism website. Up on the plateau, there are snow gums and alpine meadows perched high above the steep valleys, complete with magnificent sphagnum bogs providing unique and diverse habitat. Six rivers rise from this mountainous region topped by thick Antarctic Beech forests of this splendid national park. In the lower valleys, you’ll see subtropical rainforests and those new-born rivers tumbling over rocky cascades and river rapids. Most of the area is unspoilt wilderness and it’s a well-known destination for adventurers of all ages. The unique location and topography of Barrington Tops provides the perfect ‘edge affect’ for many native species: it’s the meeting place where many southern and northern species find their distribution limits. The park’s varied environment protects more than 50 rare and threatened species. The major rivers of the Barrington Coast are born high in Barrington Tops: the Manning, Barrington, Gloucester & Karuah Rivers. The Barrington and Manning Rivers are only two of the many wild and scenic rivers and tributaries which offer fabulous canoeing for beginners and experienced paddlers alike. The Barrington River is our favourite, flowing through scenic gorges, forming white water rapids in its upper section, and calm flowing pools in its lower section as it passes verdant farmland. It makes the perfect opportunity for paddling adventures to commune with nature, have fun and develop life-long skills. The Barrington River is formed at Edward’s Swamp, a sphagnum moss wetland within the spectacular sub-alpine area of Barrington Tops. From there it flows through scenic gorges, forming white water rapids in its upper section, and calm, tranquil pools in its lower section. A little more off the beaten track, the Barnard River is a great touring river, a quiet wilderness which can be explored at leisure and which joins the Manning River at Bretti Reserve and eventually flows on down to the Pacific Ocean at Taree.